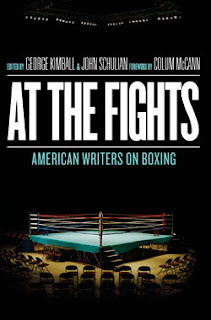 This past month, journalist and author Pete Hamill was selected by the Boxing Writers Association of America as the winner of this year’s A. J. Liebling Award, and his work appears in the just-published At the Fights, which collects the very best writing on boxing by forty-eight sportswriters and essayists. A veteran reporter who has written for each of the major dailies and several of the weeklies in New York, Hamill served as editor-in-chief of both the Post and the Daily News. But his first story to appear in print was in a Greek-language weekly, for which he served as art director. It was a profile (published in English) of José Torres, who in 1958 was an up-and-coming fighter training at the Gramercy Gym. The proprietor of that gym was Cus D’Amato, who during the course of a career spanning more than fifty years “earned a reputation as one of the most forthright and honest men in boxing,” notes the excerpt from The Boxing Register on the International Boxing Hall of Fame’s website. Indeed, that honesty—his animosity toward the corruption that pervaded the sport and his refusal to work with the monopolistic International Boxing Club—undoubtedly hurt him and his fighters both financially and professionally. Yet, in spite of the obstacles, one of the Gramercy Gym fighters, twenty-one-year-old Floyd Patterson, in 1956 became the youngest boxer ever to win the world heavyweight championship. And José Torres, too, would eventually win a silver Olympic medal and the championship in his weight division and, later still, would be an author in his own right. During the following decades D’Amato endured bankruptcy and was forced to sell the Gramercy Gym—although in 1971 his name re-entered the headlines when basketball legend Wilt Chamberlain briefly toyed with the idea of fighting a match against Muhammad Ali and proposed that D’Amato become his trainer. He opened a new gym in Catskill (outside Albany, NY), where in the early 1980s he met an orphaned teenager from a local reform school who showed promise as a boxer. He eventually became the legal guardian of the youngster, who would win all his professional boxing matches under D’Amato’s management. D’Amato died in 1985 and Pete Hamill wrote the following tribute. Two years later the young man, Mike Tyson, now barely twenty years old, would eclipse Patterson’s legacy as the youngest boxer ever to become the world heavyweight champion. In those days, you had to pass a small candy stand to get to the door of the Gramercy Gym on East 14th Street. . . . If you don't see the full story below, click here (PDF) or click here (Google Docs) to read it—free! Great timing! I'm reading The Contender with my 9th graders. Thanks. This will be a nice extra piece for the stronger readers. Thank you again for the story "Xingu," that I suggested. Perhaps it was in the pipeline already, but I was more than pleased to see it. I can't help wondering when there will be another story STORY. I like a zinger or a yarn. Since we are in a period of pretty quick inflation, with perhaps the double-digit variety to hit within the next two years or so, how about a little sidelight on the cost of living? Dorothy Parker: The Standard of Living. If you know of a story that really sh$ows the effect on folks of inflation, please see if it fits into your plan. Thanks again, Marilyn Turner, mhust73@gmail.com.